The Dell Venue Pro, previously available on T-Mobile, is now available from Dell for AT&T. Priced at $99.99 (with a new 2-year agreement), the Dell Venue Pro is available in 8GB, 16GB ($149.99) and 32GB ($199.99) storage configurations. To date, the 32GB model is the largest we’ve seen in a Windows Phone, not counting microSD expansion. You won’t see the Dell Venue Pro at your local AT&T stores. 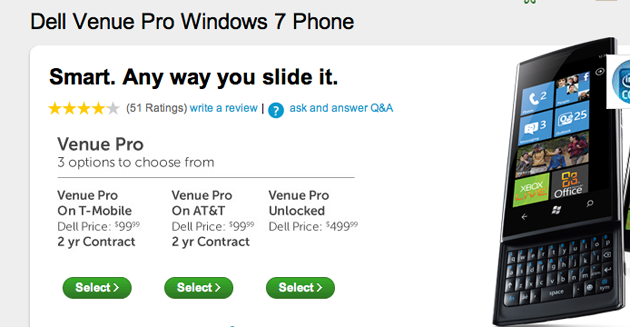 In fact, ordering is limited to Dell.com. Those looking to purchase off-contract can expect a price tag of $499.